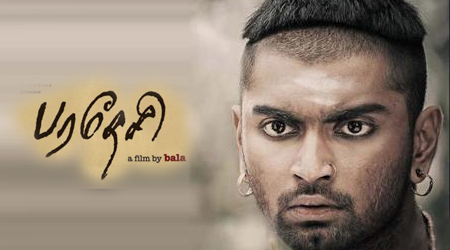 Tamil film 'Paradesi' directed by Bala has been nominated for eight major awards in London International Filmmakers Film Festival(LIFF) 2013. 'Paradesi' is National award winning movie for Best Costume Design done by Poornima Ramasamy. 'Paradesi' is an Indian Tamil drama film based on the real life incident that took place before independence in the 1930s. It was released on 15th March 2013. This story is based on the novel 'Red tea' written by Paul Harris which has the true story about the plight of tea plantation workers in South India. The English title of 'Paradesi' is 'Vagabond'. This movie has been nominated in eight categories, in which Bala is nominated for four of the categories. 'Paradesi' marks the statement that, 'its the very first Tamil movie' to be a part of the International competition which has ­films from America, Russia, Lebanon, South Korea, Chile and all over Europe. The movie also have the credentials of being the first Tamil film to hit 60 screens in North India alone. In the eight categories nominated, Bala has taken the part of being nominated in four categories. LIFF is going to be held from 12th to 18th October 2013 at Ealing, London as mentioned in its official page. Watch out the official trailer of the movie holding the honour of being nominated in LIFF.